The NSR-PG gripper is the first gripper to enable automated metrology, with its high measurement precision. New Scale’s powerful URCap plug-in for UR cobots makes it simple to program measurement and sorting tasks, making use of the intuitive UR teach pendant and teachable arm positions. But once you have made the measurements, how do you get them out of the robot and onto another system for recording and analysis? This video provides an overview of the process of measuring parts, transferring the data to a server, and recording and plotting the data. 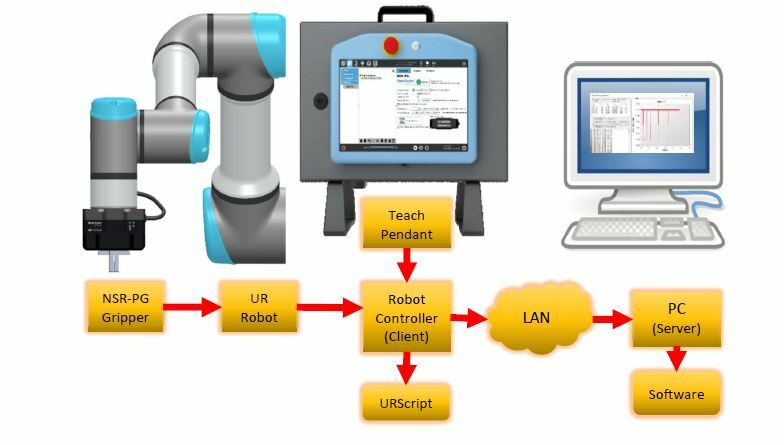 Our tech note provides detailed instructions and a complete working example, with sample code showing how to program the UR robot (URScript), and a Windows PC server-side program example written in C#.